Aside from her hair texture, her wit and her cheekbones, Mom passed something else down to me. The love of Mary Poppins. It’s one I wear proudly (see Halloween Costume) and have written a ton about. Naturally, I couldn’t put in a few words on the latest Mary Poppins hoopla with Saving Mr. Banks. 1) I had no idea they were making this movie. 2) I had no idea this story existed (the book rights story). 3) I don’t think I can wait until Christmas. 4) The movie poster is genius. Alright, here is a long awaited Mary Poppins Halloween costume picture. Disclaimer: The shirt, skirt and umbrella I own. The hat (and all its pieces) and bow tie were made out of paper. Thanks YouTube for your folding how-to videos. And thanks creativity for kicking in and ensuring I didn’t spend $1 on this outfit. 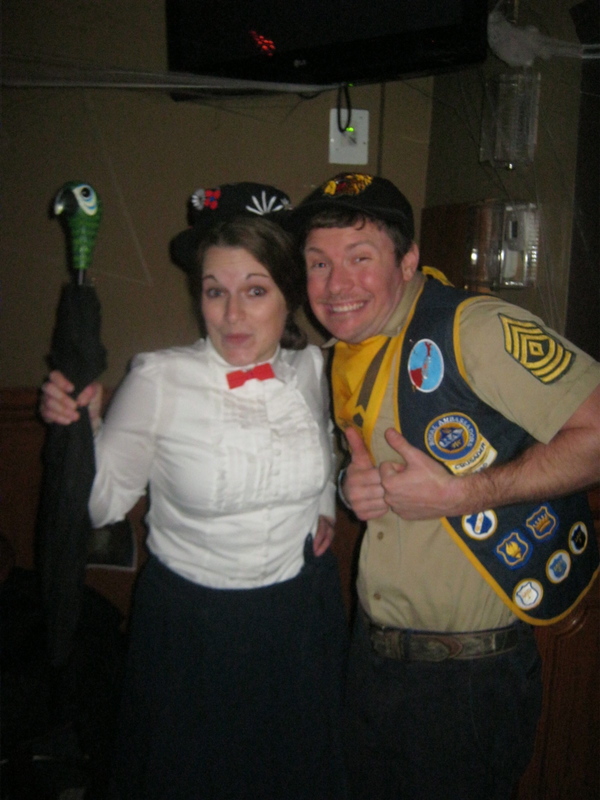 Mary Poppins and a Boy Scout. A nanny’s job never ends. Why do I vote? Well, it’s because my Mom bought me this book as my first chapter book when I was in first grade. I read They Led the Way religiously as it featured women who beat the odds and are to thank for today’s world. One of my favorite stories to read was Elizabeth Cady Stanton’s story. I’m not sure why I was so intrigued with her tale, but she’s someone who has stuck with me over the years and one I think of every four years as I go to vote. Fun fact: When trying out for the high school musical, I sang this song for my audition. I was casted. My friend Katie recently made the plunge into the blogging world. She’s talking of fashion and home decorating and anything else that pops into her head on Ella Bella Bea & Flo. Needless to say, I was worried I wouldn’t “get” much of what she’s writing about. But I was wrong. Way wrong. Last week she posted about making a “Leap List.” Instead of creating resolutions that take a year to accomplish, you make little goals that require a leap. Katie’s leap list focused on buying art. It got me thinking, what’s one thing I’ve always wanted to do, that takes one simple step to actually do? Then it hit me. Or rather, it tapped me. Tap dancing just seems to exude a breath of fun. You flail your arms and legs around while stomping and creating a ruckus sounds like the perfect way to burn some steam and stress. I’m not sure why I’ve never scratched my tap dancing itch. All it takes is a simple phone call to find classes, buying the shoes and then going to class. So I did it. I called, bought and now, I will dance. 1) Just because you can make people laugh, doesn’t mean you would be good at stand-up and/or improv. I like to consider myself someone who’s witty and quirky and all around hilarious, but after watching these shows and groups and people taking the stage, I could never in a million years do that. Scripted stuff, I could probably handle, but stand-up? No way. 2) There are a lot of Jewish stand-up comedians. At the Best of Fest on Friday, every other person who took the stage seemed to be Jewish. Maybe this is now a requirement in order to be funny these days. 3) Somethings still go over your head. I thought I was pretty with it on most of the jokes, but 45% of the skits on Saturday night totally went over my head and I was utterly confused. 4) Falling is still funny. But nearly falling is even funnier. Sad on Vacation (the group where my friends knew a guy) performed a skit with a guy on roller blades who just did insane tap dancing on the stage. You just sat there waiting for him to fall (he never did) and you were in hysterics watching him flail around the stage. Highly recommend attending some type of underground comedy show in your area. Maggie, Brian and I went to one about a month ago that was free and while some of the acts weren’t that great, there were some stellar ones. It’s pretty comical (and inspiring) to see these people take everyday situations and make them a punch line. Needless to say, I’m more aware when I’m walking around. There’s comedic relief everywhere you look.